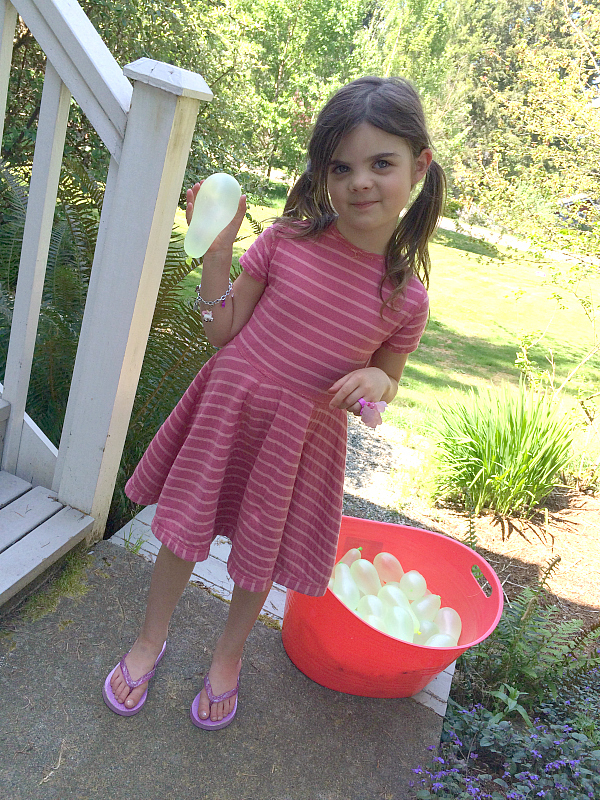 We had record breaking temps yesterday in the Pacific Northwest and on my way home from preschool I stopped to grab some water balloons for my kids. I wanted to fit in a learning activity for my 5-year-old who is in kindergarten because we often skip the optional homework, and we haven’t done any sight word practice for a week. 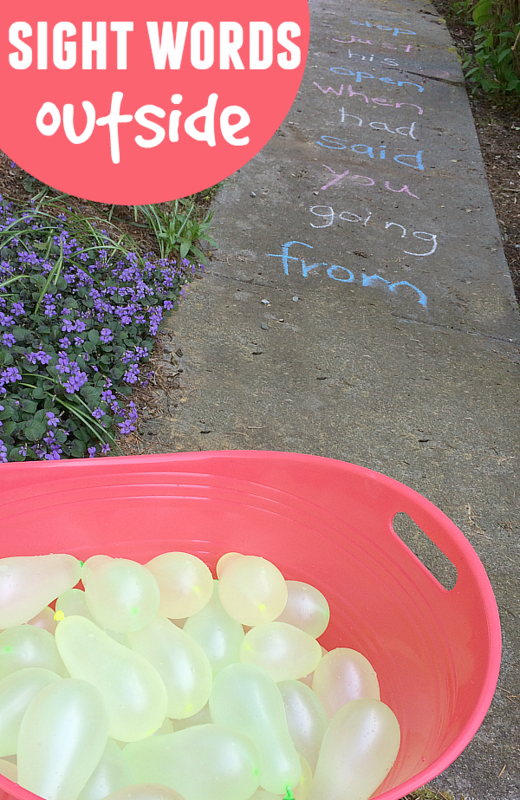 What better way to work on sight words than by throwing water balloons at them? 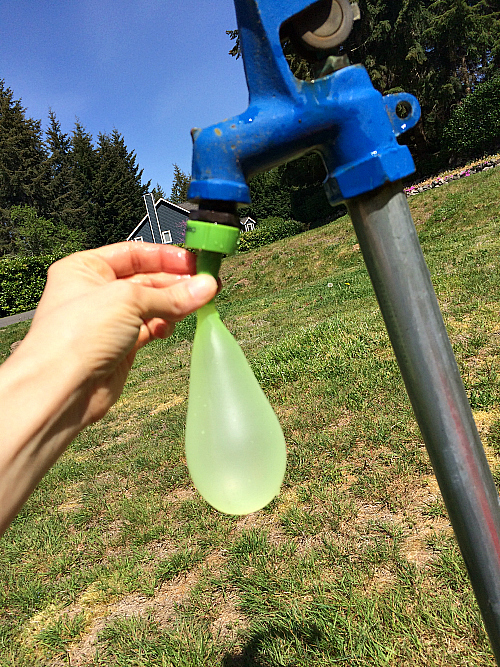 This is such a simple activity you will be spending most of your prep time filling balloons. 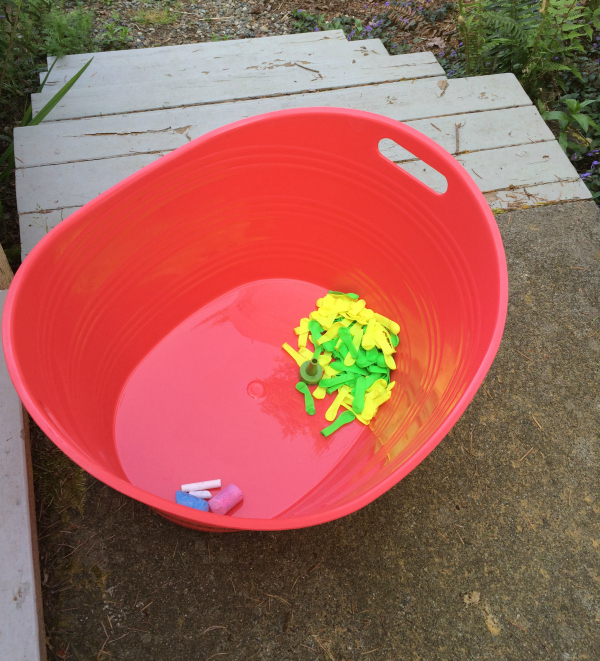 I filled a bunch because after this activity I let my kids go wild. There were cheers and tears. And I left with soaking wet jeans. Gather your materials. 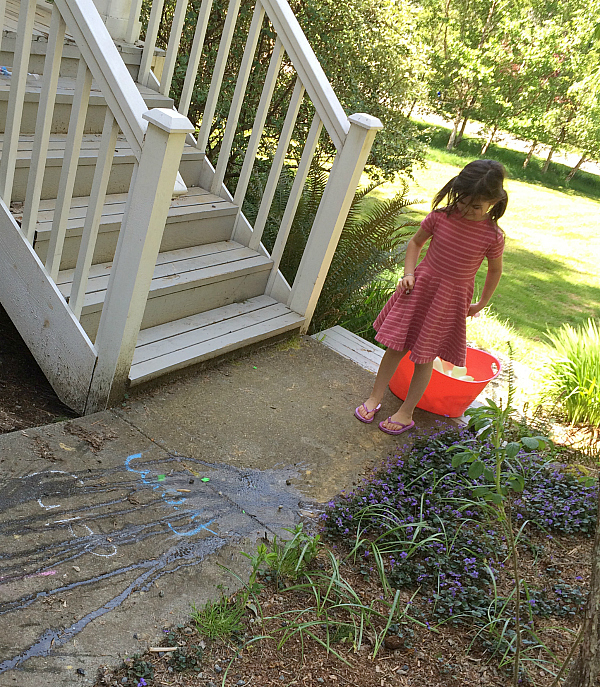 You will need water balloons, sidewalk chalk in a few colors (Check out Instagram for a video to see why I use multiple colors), a bucket and a sidewalk. 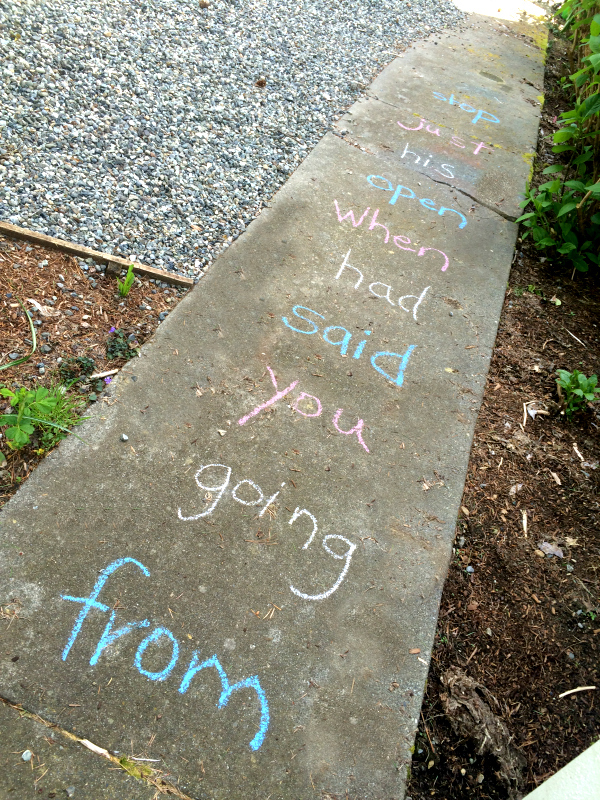 Write out the sight words on the sidewalk. I am using words that I know she is close to mastering, some she has mastered and a few I am testing out. If your child has a list from his or her teacher, use those! Fill the balloons. Try not to use too many inappropriate words as a few explode in your face, especially if your kids are around. Sunglasses help, a lot. Time to add some muscle! She was so excited to try this. Call out a word and throw a water balloon at it. I had intended for her to stay at the bucket and throw. 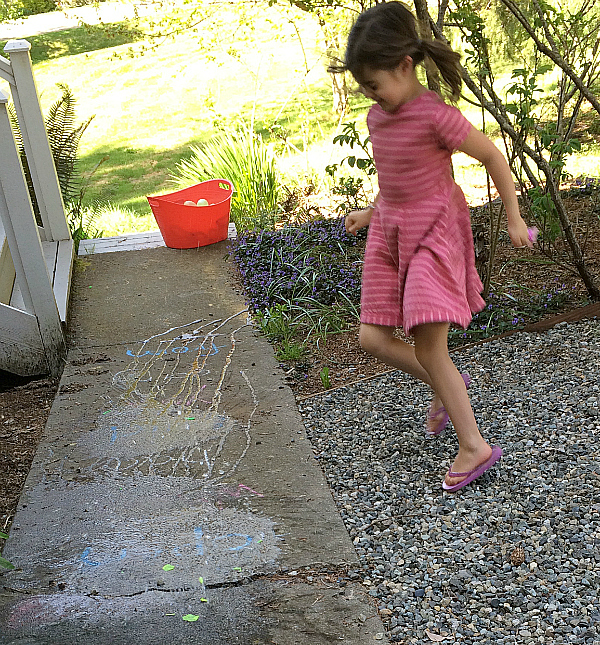 But she moved closer to the words and bombed them with the water balloons. Did this change the goal of the game? No, so I didn’t even mention it. My phone was used for these photos because I was afraid of my good camera getting wet. Good thing too! Because I got hit with more than a little splash. This game is the epitome of the name of my blog No Time For Flash Cards. Because it uses something that just plain needs to be memorized. 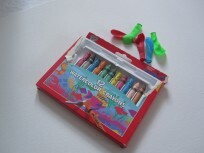 Such as math facts and sight words but turns the process of memorization into a game leaving those flash cards behind. The pictures are not the best quality, but I love how happy she is in it, can you tell? Maybe it’s just because she is my kiddo and I know her truly ecstatic face. But trust me, that’s it! 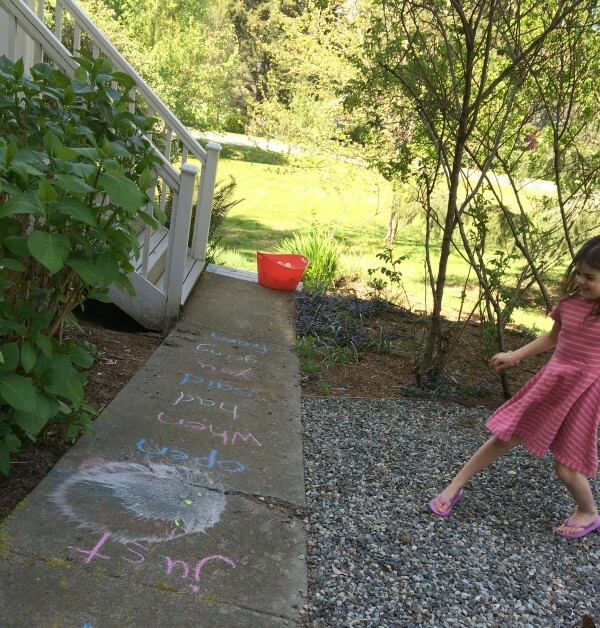 How do you work on sight words with your kids? Tell me here in comments or over at my Facebook Page! 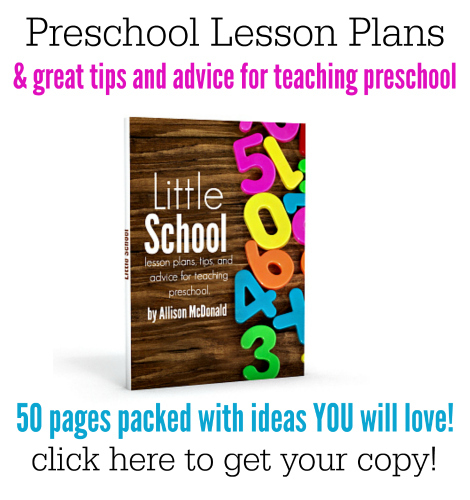 If you like this activity, you will love the ideas and circle time lessons I share in Little School my ebook of preschool activities. This is amazing and so much fun!! Great idea for the weather coming! My son is in preschool. 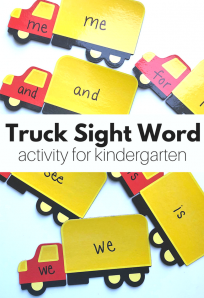 We have just started some sight word activities and will be sure to add this to my list! How much fun is your little girl having?! 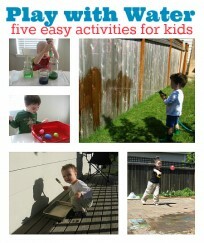 This is a great idea to get your child outside and learning at the same time. Thank you for sharing!